Suitable for your big sweetie, your little sweeties or just a home decor item to make your home look a little sweeter! 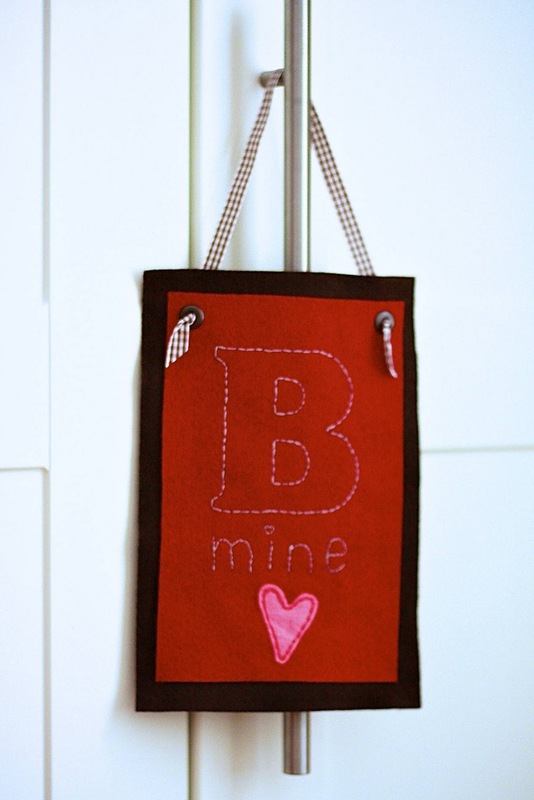 commence your needlework - no worries, it doesn't have to be perfect, as you can see on my sample - and yes, that is a heart for the dot above the "i" in "mine"
hang proudly, or hide until it's time to gift it to your sweetie! I am not a master needleworker, so you should have no problems with this project, either. Remember, it will be treasured because Mommy made it...our little one's eyes are not as critical as our own. I truly believe they will think it's awesome. I love felt projects! This is just adorable. Lovely project! You are rocking Heart day Girlfriend! !